This week, read something else! I’m giving you the link to the short version, but the long version is available here for those wanting a more in-depth analysis. Which reminds me, in amongst trying to do my job I also have to write to my MP again because from what he’s told me already, he hasn’t grasped the full import of what’s happening. I’ll write that up once I’ve had more correspondence with him. There has been much a-do about the Enterprise Regulation Reform Act (ERRA) and I’ve written about it before and shall no doubt have to write about it again. Much to my irritation. In response to the many millions of words written about it and an e-petition on the Number 10 website, which currently stands at almost 27,000 signatures, the Intellectual Property Office has issued a statement which it hopes will calm the fears of photographers. The problem with the document is that writing the word “Fact” in bold lettering at the start of a sentence doesn’t make that sentence irrefutable. There are still too many variables, too many vague answers to specific points and the act has as yet no regulations applied to it, which is why so much that has been written can only guess at what the real purpose of the act will be. Reading the statement, what kept jumping out for me was the idea that orphaned works could be licensed and licensed “at the going rate.” I’d very much like to know how a government-appointed agent will decide the “going rate” for any particular photo. How will they know whether or not consent for the proposed use would have been granted without the author having been contacted? How will they know what the rights holder would have charged for the use of that image if they were given the choice? How will anyone not connected to the image or its author know if any people in the photo would be happy for their likeness to be used in any given context? Who will even know which country the image originated in? Or whether the original client for that photo is happy for others to use it? Many images (most of the ones I take for my living) are supplied on an exclusive basis. It will be interesting to know how on the flip-side of this, the rights-holder is supposed to discover their work has been used and then claim whatever money (or Green Shield stamps or bellybutton fluff) has been held in safe-keeping for them. Are creators expected to constantly check an ever-expanding register of works for use of their images? If the granting of licences is an exception rather than a rule, this might even be possible, but it’s still not ideal and still rides roughshod over the basic tenets of copyright. IF the IPO had come straight out and said “this act will ONLY apply to works held in recognised historical archives” a lot of fears might have been assuaged, but they didn’t. The IPO also makes no mention of any plans to strengthen moral rights – the right to be identified as the author of a work, the right not to have one’s work mis-attributed and in particular, the right not to have identifying data stripped from one’s images. Simply by re-enforcing the the creator’s right to have their identity kept with the work would be a start. The problem with the IPO’s statement is it’s lack of clarity, either through insufficient understanding of their own subject, or because there is unseen industry pressure to keep things vague until the great reveal of the guidelines by which time it will be too late for photographers to properly and comprehensively defend their rights. Given tight enough regulation, the ERRA could be a good thing for photographers by making it clear our works, even where their identifying data has been removed, are not orphans, but until the guidelines are published we have no idea of the intention of the legislation. By the time we do know, it’ll be too late to do anything about it. I have a terrible feeling we’re being inched towards a goal that was decided upon long before Hargreaves set up his review. One of the things I love about my work is meeting interesting people and finding myself in interesting places. 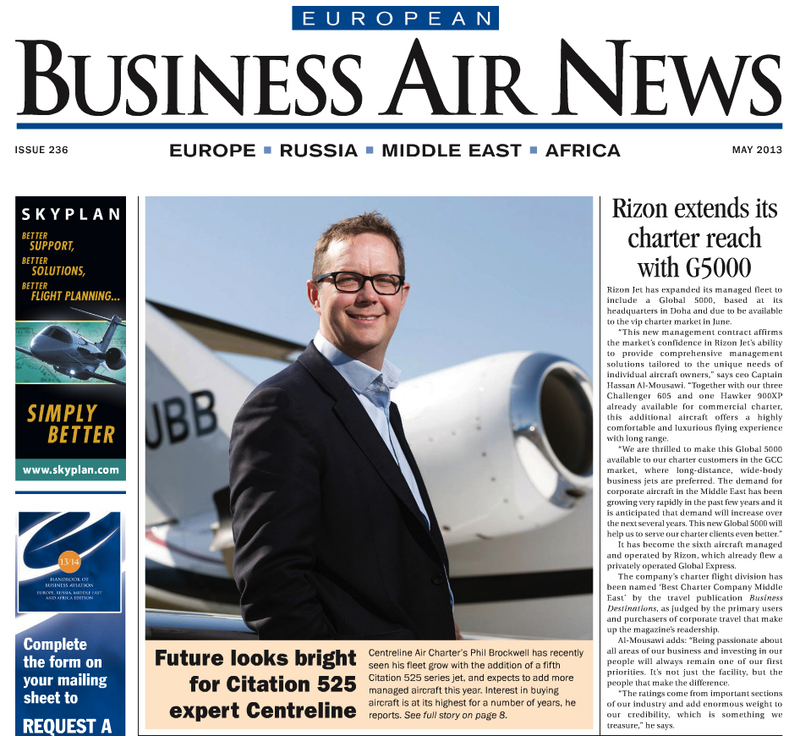 A fine example of this was an unexpected assignment for Centreline Air Charter, based at Bristol Airport, where I was asked to take a portrait of Centreline’s CEO Phil Brockwell for European Business Air News, who were to run a front page story on the company. Centreline didn’t have a suitable image and called me up to help them. EBAN might very well not be a publication you’re familiar with unless you happen to own an aircraft operation in Europe, Russia, the Middle East or Africa. You don’t? Fair enough. To be fair, I’d not heard of it until the call came, but I strongly believe that all publications, even trade ones, deserve decent photography. Phil is one of the friendliest CEOs I’ve ever met and it’s not every day I’m asked “where would you like the jet?” I suggested the South of France, but Phil meant where on the runway apron. Maybe next time, eh? One of the difficulties I had with this particular portrait was that the sun was especially harsh, in the wrong spot (it almost always is, ask any photographer), and we needed one of Centreline’s shiny white aircraft in the background too. My choice was either to have Phil squinting into the sun, or silhouetted against the bright backdrop. I had one other trick up my sleeve; bright backdrop but with tricksy fill-in flash on Phil (or Phil-in flash if you will… ouch) so that both background and subject would look good. Having had the jet moved to where the shot would work best, I set up Phil where he needed to be and set my flash and camera to mitigate the sun, took a few test shots, made adjustments, took some more test shots until I could see we were getting close, made further slight adjustments, then got on with the real deal. I knew I couldn’t spend a ton of Phil’s time getting things right, but it was nice to be given enough time to set things up properly and also get a variety of shots so that Centreline’s public relations handler would have a choice of images to put over to the magazine. Apart from having to come off the runway for a coffee break while another jet came into land, the whole shoot was done in under an hour. More than 10 minutes is a real luxury when shooting CEO portraits and I was grateful for the time, but I also think the results were worth it. The same day I delivered the images to Centreline’s PR, captioned and ready for publication. Their (and my) preferred shot made it to the cover of EBAN as planned and you can see the result below and read more of Centreline’s story here. A good result I’d say and a very satisfying assignment. I certainly didn’t wing it (ouch, again). 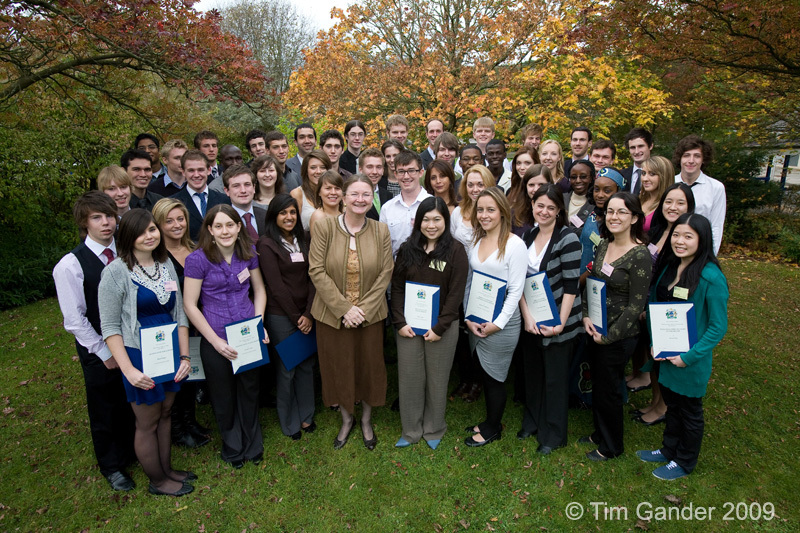 Five years ago I covered an event for University of Bath which celebrated the granting of sponsored scholarships to students. 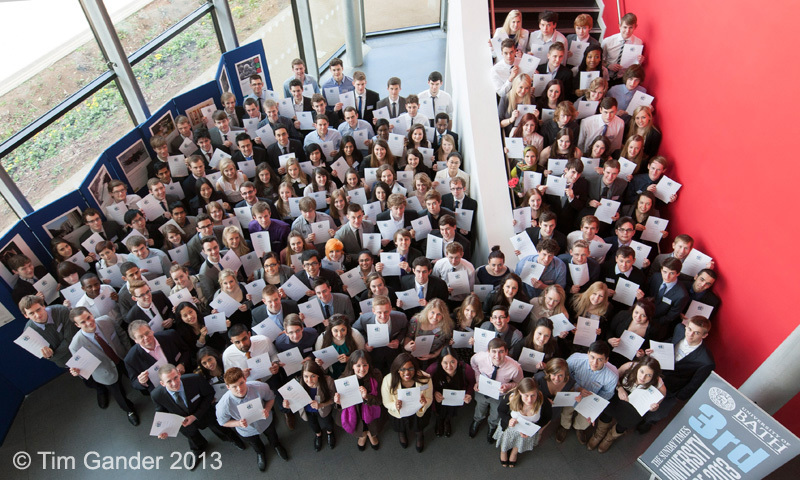 Certificates were given and a group photo consisting of around 50 students was organised. Last month I covered the same event which has grown hugely since its inception. This time the group photo was of almost 150 students. It’s sometimes interesting to look back on assignments which have repeated down the years and see how they’ve developed. This scheme grew very quickly, and I won’t bore you with every group shot I’ve taken, but the contrast between 2009 and 2013 is certainly pretty stark. The first photo was taken using a stepladder, the latest using a mezzanine floor overlooking the foyer of the building where the presentations took place. I don’t know if the event will grow even more, but maybe in a few years’ time I’ll need a crane lift and a fisheye lens if I want to get the entire scholarship contingent in the frame!